Description: Price is for 5 rectangular sheets of 100% pure natural honeycomb-patterned beeswax (Candle grade; not edible. Dimensions: 8 inch by 16 inch) and 2 metres of 100% cotton wick. Free of all chemicals and artificial colour and fragrances. 100% all natural. Each sheet can make a pair of charming, elegant handrolled candles of size 10cm (height) by 3.5cm (diameter) approximately. So, you can make a total of 10 candles with the 5 sheets and wick. Burn time of each candle: 4-5hrs. Note: Colour of beeswax sheets can vary from orange-brown to orange-yellow to light yellow depending on the batch. This is largely determined by the type of pollen the bees collected and the climate. 1) If you never knew why beeswax candles are so superior, find out from: Beeswax Candles Versus Paraffin Candles. 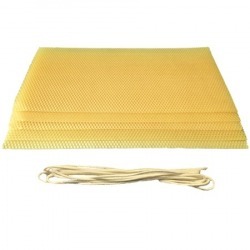 2) Check out our handrolled beeswax candles made from these beeswax sheets. 3) Check out this video if you need instructions on how to make handrolled candles with these beeswax sheets: How to make beeswax candles. 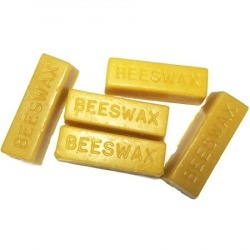 Description: A set of 5 blocks of 100% pure, hand-poured, orange-yellow-brownish beeswax (1 Oz each). 100% all natural. Free of all chemicals and artificial colour and fragrances. 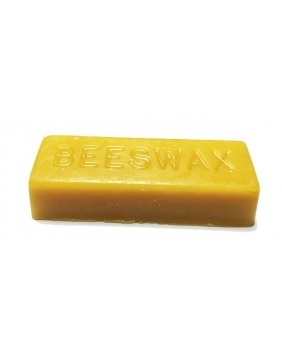 ☛Note: This beeswax is naturally scented by the honey and floral nectar in the honeycomb. Thus its scent may vary from batch to batch depending on the harvesting season and geographical location. Colour of these beeswax blocks is also largely determined by the type of pollen the bees collected and the climate and varies from light yellow to orange to brownish yellow/orange depending on the batch. These premium quality beeswax blocks are safe for personal care and can be used as an ingredient for creams, lotions, balms, and soaps. They are also perfect for candle making, leather weterproofing, wood conditioning and polishing, waxing sewing thread, lubricant for furniture joints, encaustic painting, and other crafts. The small 1-oz blocks are designed for easy melting. Description: A 5 Lb (Approx. 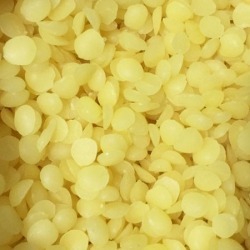 2.3kg) bag of 100% pure, yellow beeswax pellets designed for quick melting. 100% all natural. Free of all chemicals and artificial colour and fragrances. This beeswax is naturally scented by the honey and floral nectar in the honeycomb. Thus its scent may vary from batch to batch depending on the harvesting season and geographical lcoation. Suitable for making DIY skin lotions, creams, balms, soaps and other craft projects, eg. candle-making, encaustic art and DIY household aids such as furniture/shoe/bag polish. ☛Note: If you never knew why beeswax candles are so superior, find out from: Beeswax Candles Versus Paraffin Candles. Description: A mild and gentle, moisturising soap by Nelson Honey, a popular New Zealand brand. pH-neutral and free of lanolin, alcohol, fragrances. 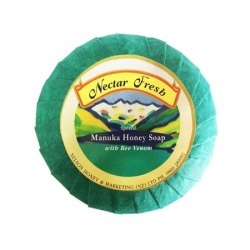 Formulated with Active Manuka honey and bee venom that are effective in cleansing the skin thoroughly and healing rough skin, this all-natural, nourishing soap is also popular among those who are allergic to perfume and people with eczema. Bee venom is believed to be the beauty secret of many celebrities in keeping their skin ageless and radiant. Other Remarks: Suitable for all skin types, Manuka Honey has become a staple in skin care regimens. It provides a substantial amount of vitamins and minerals, including vitamins A, B, C, D, E and K, beta-carotene, enzymes and packed with antioxidants. Unlike most lotions, which stays on the surface of your skin and trap moisture in, Manuka Honey draws moisture into your skin. 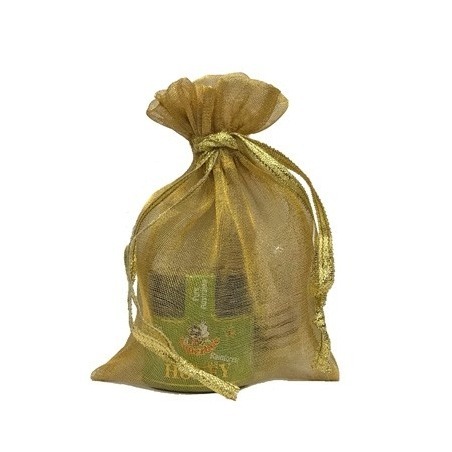 Its rich nutrients create a natural thin layer of moisture to promote healing and cell repair. Ingredients: Sodium Palmate, Sodium Palm Kernelate, Water, Nectar Ease, Sodium Chloride, Glycerin, Tetrasodium EDTA, Tetrasodium Etridonate. Description: Suvana Paw Paw and Honey Balm (25g) contains no petroleum jelly. 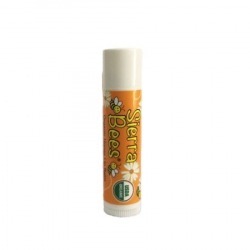 Completely natural and free of all synthetic preservatives, chemicals and fragrances, this multi-purpose balm is known for its awesome healing properties; it soothes, softens and moisturises chapped lips, dry skin and dry and cracked elbows. Ingredients: Beeswax, Coconut Oil, Cocoa Butter, Papaya (Paw Paw) Extract, Honey, Jojoba Oil, Natural Vitamin E.